I’ve noticed over the last several years that more and more symphony orchestras are doing concert events where they perform the score to a popular or classic movie in synch with it. Raiders of the Lost Ark, one of the Harry Potter films, the Wizard of Oz, Casablanca, Bugs Bunny cartoons. Classical music audiences are dying (literally) and these events get people to come hear a symphony orchestra live in concert who maybe haven’t done so before. These aren’t easy to pull off. The conductor is tasked with keeping the orchestra in synch with the film, with a click-track in their ear for the entire 100 or so minutes. The stakes are even higher with a musical like Oz or Sound of Music because you cannot be ahead or behind by a fraction of a second. I’ve seen a slight increase in booking for my scores for silent comedy shorts. They’re great for an orchestra looking to give this a shot without the feature-length commitment and the stress of nanosecond-perfect synch (the scores don’t require use of a click-track), and they can be part of a full music program. 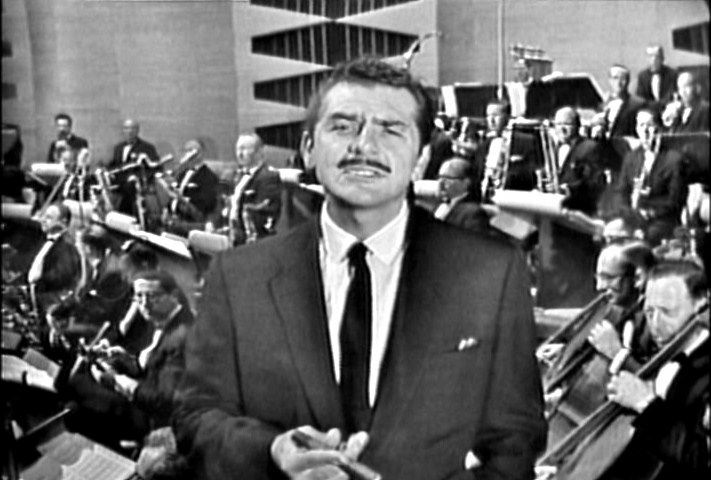 Ernie Kovacs had a deep love of classical music, one that was fostered by wife Edie Adams. She expanded Ernie’s horizons beyond the “picture-postcard” music he was familiar with when they met to other works by composers like Bartok, Shostakovich, Prokofiev, Karajev, and more. Ernie may very well be the first to do music videos. He called these “sound-into-sight” pieces, where he’d create and stage visual interpretations of classical music he loved. They were somewhere between being pantomimed to a piece — like his Beethoven’s 5th sketch — or surreal Dada-sequence stream of conscious things like the musical office thing he did with Esquivel’s recording of “Jalousie”. I’ve been thinking it would be interesting for an orchestra to perform live to accompany one of Ernie’s music pieces. There are a handful that utilize music from the classical canon that is probably already in a philharmonic’s repertoire. Doing these Kovacs videos would also put the attention back on the orchestra, instead of them just being background to a movie people have come in to see. Along with the poker game set to the opening of Beethoven’s 5th, there’s the ballet from Swan Lake performed by gorillas in tutus, the operating room surgery that fits Stravinsky’s “Firebird”, the noir-ish street scene that was done to the opening movement of Bartok’s “Concerto for Orchestra”, and what I think is Ernie’s masterpiece, “The Story of a Drop of Water” that goes with Prokofiev’s “Lt. Kije Suite”. I suppose, if you had the money to have an arrangement for chorus and orchestra done, you could also do the Nairobi Trio routine. Stravinsky’s “Firebird Suite”, from Ernie’s 1961 special aired during the Thanksgiving season.